We’d love your help. 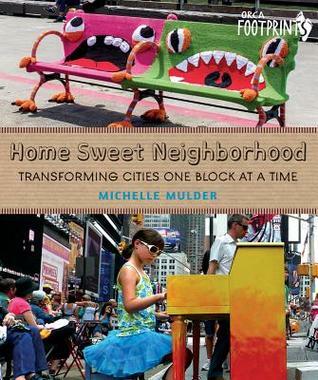 Let us know what’s wrong with this preview of Home Sweet Neighborhood by Michelle Mulder. Picture a busy avenue. Now plant trees along the boulevard, paint a mural by the empty lot, and add a community garden. Set up benches along the sidewalks and make space for kids' chalk drawings, and you've set the scene for a thriving community. Placemaking--personalizing public and semi-private spaces like front yards--is a growing trend in cities and suburbs around the Picture a busy avenue. Now plant trees along the boulevard, paint a mural by the empty lot, and add a community garden. Set up benches along the sidewalks and make space for kids' chalk drawings, and you've set the scene for a thriving community. Placemaking--personalizing public and semi-private spaces like front yards--is a growing trend in cities and suburbs around the world, drawing people out of their homes and into conversation with one another. To ask other readers questions about Home Sweet Neighborhood, please sign up.